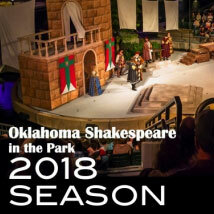 Pack your picnic basket, grab a seat in the amphitheater and get whisked away to a magical place when the Oklahoma Shakespeare Company brings Richard III to the Myriad Botanical Gardens Water Stage in OKC. Shakespeare’s stunning portrait of Machiavellian genius weaves a spider-like web of roller coaster lurches and plunges chronicling the king’s murderous quest for absolute power and the moral demise and military fallout from it. At the end of the bloody Wars of the Roses, the Yorkists look forward to a period of peace under the freshly coronated Edward IV, but his younger brother, Richard, Duke of Gloucester has other plans. Deformed and jealous, Shakespeare’s Richard is a villain who schemes to obtain the throne through any means necessary, no matter how nefarious.